We are reasonably confident that you’ll win at least 70 percent of the vote in March. The challenge is turnout: your share of the votes will go up with lower turnout, but low turnout – say under 60 percent – would undermine your authority. Turnout that is well below expectations – say, 55 percent or lower – might delegitimize your reelection, both at home and abroad, and increase the risk of political instability going forward. There are many reasons to expect turnout may be lower than hoped. A December poll by the Levada Center suggested it would be 52-54 percent, a conclusion supported by other professional forecasters. Fortunately, a Levada Center poll from last month gave slightly more encouraging results: turnout at 58, with 75 percent likely to vote for you. But recall that turnout in the September 2016 parliamentary elections was 48 percent. To date, the lowest turnout in a presidential election in which you participated was 64.4 percent in 2004. We estimate turnout this time will be similar, which would be fine. But the risk is there that it will be lower, and possibly considerably lower. 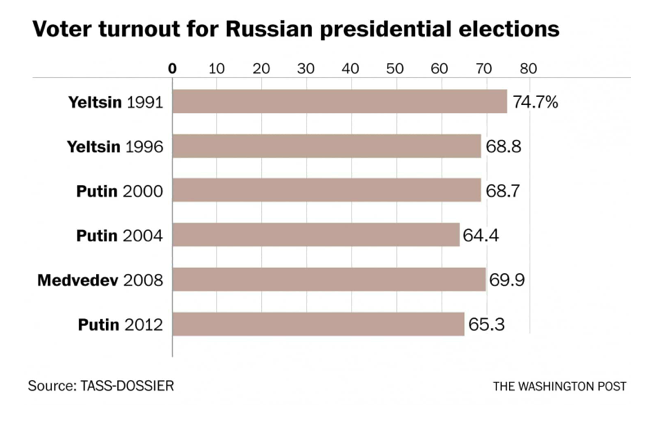 There are many reasons why turnout may be lower than in the past. One factor is that the surge in patriotism, and the surge in support for you personally, that came with our annexation of Crimea has abated. Material conditions for the electorate have deteriorated since 2008, and voters doubt they will improve much, if at all, during your next term. They don’t feel this election will affect their lives very much, they know the outcome, and have become more apathetic about political life since the drama of late 2011-early 2012. Another factor, of course, is the Navalny effect. We decided, after much consideration, to prevent Alexei Navalny from running in March, our reasoning being that lower turnout would be less a threat than better-than-expected returns for Navalny. But, as we anticipated, Navalny has called for a “voters’ strike” in March, and we can’t be sure how many of his supporters, or indeed others, will answer his call. For all these reasons, we are trying to lower expectations. The 70 percent turnout figure cited in the media was a target for motivating regional and local officials – we didn’t intend for it to become a yardstick for March 18. Nonetheless, we are taking measures to increase turnout to the extent possible. We have signaled regional and local officials, educators, employers, and so on, to provide employees and subordinates with appropriate incentives to vote, including time off from work, a festival-type atmosphere on the streets, and sanctions against those who don’t cooperate, such as tax inspections for enterprises that don’t step up and workplace consequences for those who don’t vote. Regional and local political authorities in particular know that disappointing results will have political consequences. They also know that, as in the past, we won’t be scrupulous about enforcing electoral procedures, and if electoral and other officials feel the need, they can falsify results as long as the falsification is not too obvious. And in certain areas of the country, notably the North Caucasus, there’s no need to keep election fraud even within reasonable bounds. Finally, we’ve tried to raise turnout, and endow the election with a measure of democratic legitimacy, by allowing the electorate at least some choice. Our goal has been a Goldilocks outcome – not too much competition (or competition that might undermine stability), but not too little either. One interesting development is that the Communists have finally replaced their perennial, aging, and uncharismatic candidate, Gennady Zyuganov, with someone younger, less Soviet, and seemingly more modern. Pavel Grudinin is a successful agricultural entrepreneur and was not even formally a member of the Communist Party. We expect him to attract much of the illiberal left vote. He’ll help increase turnout, and he may well to come in second on March 18. On the liberal left are Ksenia Sobchak, daughter of your one-time patron and mayor of St. Petersburg, the late Anatoly Sobchak, and Grigory Yavlinsky, whose best performance in two previous presidential elections was 7.3 percent in 1996. Neither is much of a factor, in part because they will compete for the same votes, in part because many liberals will abstain, and in part because there are very few liberals left in Russia. Nevertheless, they help legitimize the election process, and they, too, will help with turnout. We also expect the division within the liberal opposition between those who support a boycott and those who decide to vote for Sobchak or Yavlinsky to further demoralize the liberals. Other candidates who may appear on the ballot (the Central Election Commission is still verifying signatures but it announced today that there will a maximum of eight names on the ballot) are non-factors: the clownish but still useful Vladimir Zhirinovsky, Boris Titov, Sergei Baburin, Maxim Suraikin, Ayna Gamzatova, and Elvira Agurbash. When your forthcoming term ends in 2024, you will have been de facto leader of Russia for almost a quarter century. Some have argued that, because the constitution limits individuals to two consecutive terms as president, and because you have been in office for so long, you will be a lame duck after March. This is incorrect, for many reasons. First, you can remain Russia’s leader beyond 2024 if you so chose. You are a relatively young, and very fit, 65, and you will very likely be a very fit 72 year-old in 2024 – just a year older, and much more fit, than Donald Trump today. One way to engineer another term would be a constitutional amendment that puts an end to presidential term limits. Another is to make a “castling” move like the one you made with Dmitry Medvedev in 2008 – that is, you could select a loyalist to replace you as president while you continue to exercise effective power as prime minister or head of an executive post such as the State Council or Security Council. There are of course many precedents for determined national leaders remaining in power well past 72 and for longer than 24 years – consider many of the post-Soviet leaders of Central Asia; Aleksandr Lukashenko of Belarus, who has been in office since July 1994); or Zimbabwe’s Robert Mugabe, who was forced out at the age of 93 after 37 years in power. There are likewise many examples in our own history: Stalin was in power 31 years, Catherine the Great for 34 years, and Peter the Great for 36 years. What matters most, of course, is will and determination. 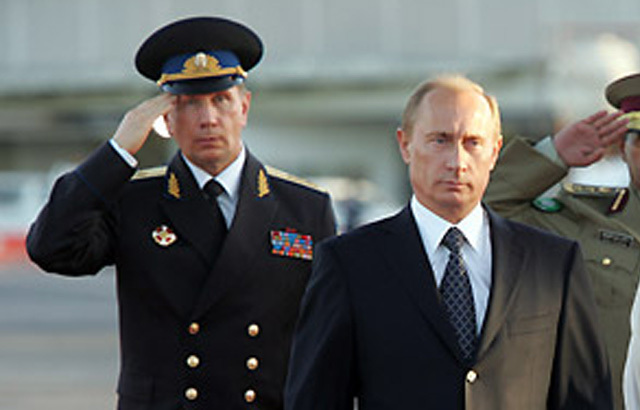 Are you prepared to remain Russia’s indispensible leader during this critical period when internal stability, and our standing as a great power, are being challenged by determined adversaries at home and abroad. Some of your public appearances in recent months have led to media speculation that you’re losing energy, that you no long want to continue governing, that you are tired, bored, or even pessimistic about Russia’s future. We know that’s not true. Every leader who has been in power for very long goes through periods when energy slacks, but that hardly means you’re ready to retire, especially when you know that doing so would pose a dire threat to the Russian state that you have served so well for so long. In short, you can remain Russia’s leader for as long as you want. You command all the formal powers afforded the Russian president by our constitution, and there are few institutional checks on your authority. But most important is the informal authority you command across the country. As everyone knows, the Russian people continue to support you. 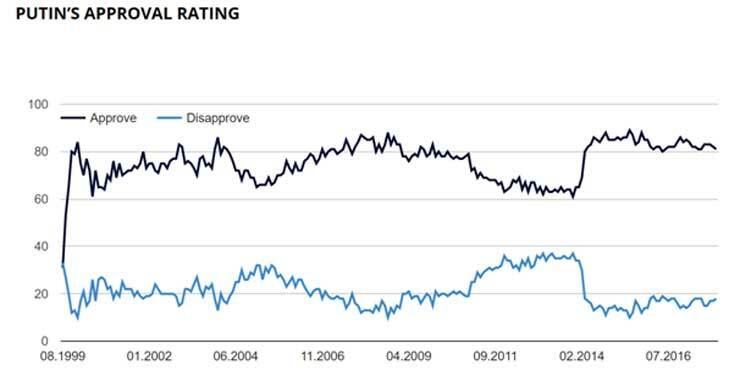 Your approval rating, despite the economic challenges of recent years, remains in the low 80s, and it has never gone lower than the high 50s. These are astronomical figures by comparative or historical standards, especially for someone who’s been in office as long as you have. It is especially astonishing in this populist era when elites, and most leaders, are deeply unpopular, in the West and elsewhere. Thanks to you, there is no threat from populism in Russia, despite the fact that most of our institutions, and our elites, are very unpopular. Were you to step down, that could change very quickly. Perhaps more important for regime stability than popular support, however, is the loyalty you command among our political and economic elite. They respect your determination to bring order to Russia and restore it to its rightful place as a respected great power, and they fear your ruthlessness in dealing with challenges to your authority. Nothing is more important to regime stability than elite consensus about the need to preserve the existing order – this we have and will continue to have as long as you are in office, but only as long as you are in office. Of course, as with any regime, democratic or otherwise, we have elite rivalries and tensions. Recently, our adversaries have made a great deal out of the trial of Alexei Ulyukayev, our Minister for Economic Development from 2013 to 2016. 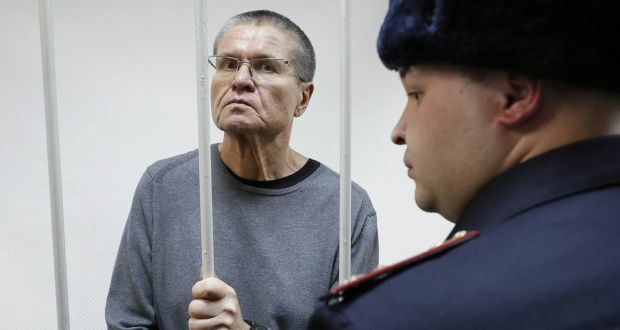 Your long-time friend and Rosneft head Igor Sechin decided to frame Ulyukayev for corruption, and in December he was sentenced to eight years in prison by a compliant court, the first minister in Russia’s post-Soviet history to serve time. Some Kremlin watchers have speculated that Sechin was acting independently of you in going after Ulyukayev, that he is ambitious, ruthless, and increasingly powerful, and that he therefore represents a threat to your authority. This is not the case. Sechin is your long-time friend and a key member of your inner circle, and he has demonstrated nothing but loyalty to you and your policies. Moreover, should you wish to remove Sechin from his position as head of Rosneft and make him ambassador to, say, London, there is no one, least of all Sechin himself, who would defy you. That is equally true if you decided to imprison or impoverish him. That is true of Sechin, and is true of anyone else in Russia, including even Ramzan Kadyrov, your strongman ally in Chechnya. The fact is that you have the means to impose your will on the elite should push come to shove. In particular, you have at your disposal the Investigatory Committee, headed by another tough and loyal ally, Aleksandr Bastrykin. We have also worked out mechanisms for deterring political challenges or eliminating threats, including use of kompromat, tax and other “inspections,” and various legal, semi-legal, and if need be illegal tools of control and intimidation. And you have a complex and redundant set of institutions that monitor and help police the elite. Finally, you continue to be the ultimate rule-giver, arbiter, and enforcer when it comes to elite conflict. Indeed, only you can keep those conflicts from spinning out of control. Your informal “contract” with the elite has been it accepts your authority and makes reasonable efforts to comply with your orders, and in exchange you will defend the positions and wealth of those who play by the rules. Should you decide to remove someone from office for incompetence, excessive greed, or what have you, their wealth, no matter how ill-gotten, will be preserved, and most will be provided with some kind of respectable alternative post. Only if they defy you – as Mikhail Khodarkovsky and Boris Berezovsky did many years ago – will they be punished, and punished severely. The essence of this deal remains in place, despite the Ulyukayev affair. Above all, our political and our economic elite know very well that preserving its position and wealth is only possible with your indulgence. I argued in my previous memo that the economy is struggling but not in crisis, that it has returned to growth and will very likely continue to grow over the next several years, and that material conditions for society have at least stabilized. (I should note that since I wrote that memo, Moody’s has raised the rating on our sovereign debt from stable to positive, citing many of the same factors I cited in my memo.) Nonetheless, we need to be realistic. The fact is that society, particularly certain sectors of society and certain parts of the country, has been under considerable economic pressure since the boom years of 2000-07. An initial point here is that almost none of the promises you made before and after your election in 2012 about economic performance have been fulfilled. Nor will they be fulfilled by 2020, or perhaps even by 2024, when your coming term ends. For example, you claimed then that the average real wage would increase by at least 60 to 70 percent by 2020. Real wages have in fact fallen by more than five percent since then, while total real income, which includes pensions and income from entrepreneurial activities, has declined over ten percent. Social spending by federal, regional, and local governments has also been declining, and we expect that we’ll be facing austerity-type conditions on the budgetary front for most or even all of your coming term. In part this is so because the healthcare and state pension burdens are increasing as our population ages. But it is also because the size of our economy, and federal revenues, have shrunk since 2014. We are therefore forced to allow pensions to decline in real terms even as we keep raising the retirement age. We are also going to have to raise taxes, including the fuel excise tax, which we expect to increase by some ten percent in 2018. Utility rates are also set to increase this year. All of this is putting pressure on our people. We’ve tried to reduce expectations, and you have been much more circumspect about promising more than can be delivered over the coming six years in your pre-election appearances. And we’ve tried to blame, to the extent possible, Western sanctions for our economic travails. But the fact is the economy won’t produce the kind of material gains, and political payoffs, of the boom years of 2000-07. 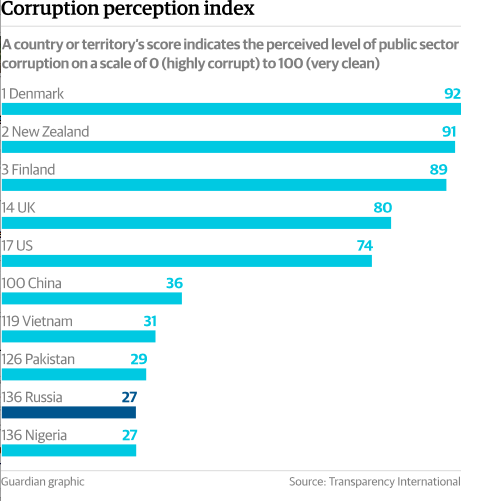 We also know that corruption, and the arbitrariness and venality of local officials, are perhaps as important a source of political discontent as declines in living standards. Our opponents, above all Navalny, likewise understand that corruption and abuses of officialdom are the most likely precipitants of anti-system mobilization, now and in the future. 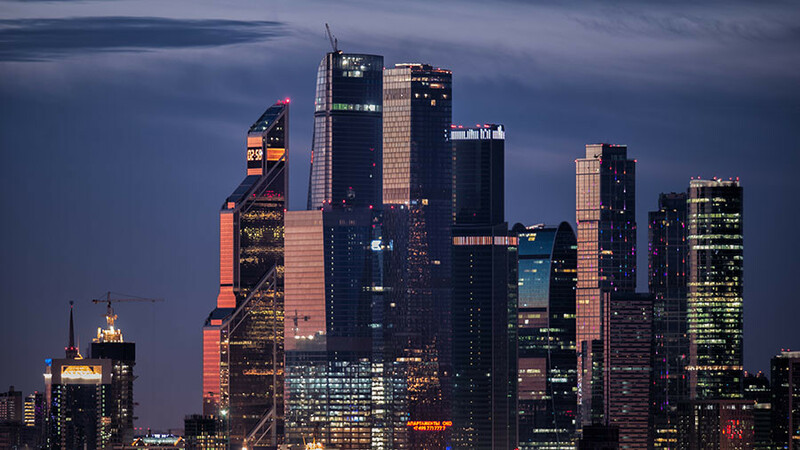 As a result, we know that it is possible that we will confront some kind of anti-system popular uprising in the coming years, especially since the West will continue to push for “regime change” in Russia. But society is mostly apathetic and politically quiescent, so we don’t think we’ll see the kind of oppositional mobilization that we saw in late 2011- early 2012. And if we do, we’re better prepared to deal with it than we were in 2011. 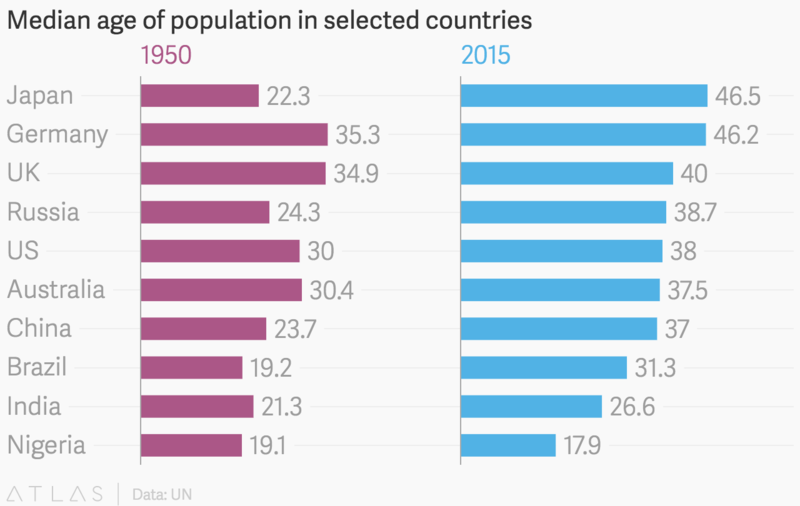 One reason to expect political quiescence going forward is demography. Our critics note that an aging population reduces GDP growth and puts pressure on social spending because fewer workers are available to support the elderly and children. That is true, but an aging population also makes anti-system mobilization less likely because older people are typically conservative and risk averse. They don’t lead revolutions, colored or otherwise. By contrast, a large cohort of young people – particularly young men, and particularly with a high level of unemployment – puts any regime at risk. 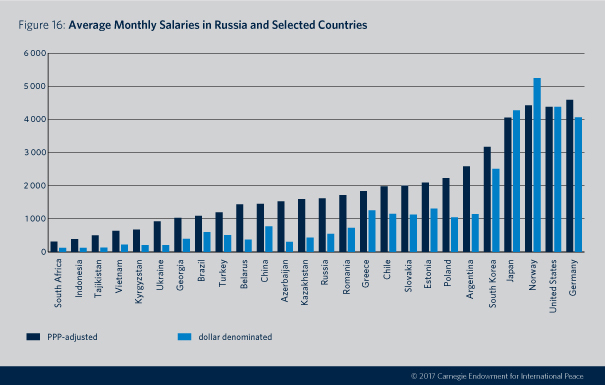 Fortunately, the median age in Russia is about 39, and we have an unemployment rate of around five percent. In this regard, it is worth considering Japan. 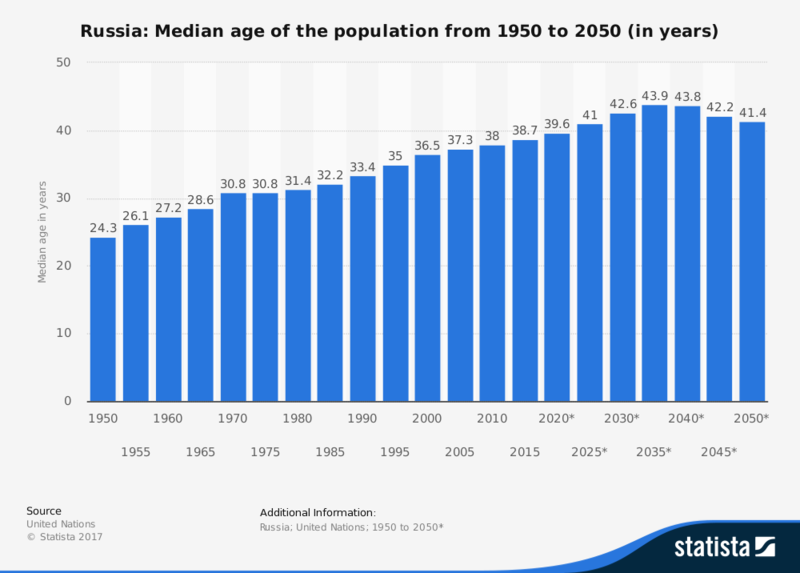 It too has an aging population, and its working-age share is considerably smaller as a share of total population than in Russia. And it, too, has a low rate of unemployment. But despite decades of economic stagnation, there has been no “colored revolution” in Japan, and neither will there be. Another stabilizing factor is memory of the recent past. Few have forgotten the dark years of the late Soviet and early post-Soviet eras. Those who didn’t experience them directly, either because they were too young or because they had yet to be born, are made well aware of our latest Time of Troubles by parents, teachers, the media, and officialdom. And you yourself regularly point out that poverty, insecurity, and violence have all declined dramatically since you first became president. GDP has grown by some 75 percent, real incomes have more than tripled, and the homicide rate has fallen from a peak of 32 per 100,000 in the early 1990s to 11 per 100,000 in 2015. Russians have other reasons to be thankful for your firm leadership. Above all, they credit you with restoring Russia to its rightful place as a global power, every bit the equal of the United States and China. Russians today are proud of our rich history, our cultural achievements, the country’s natural beauty, the strength of our armed forces and achievements in space, our victory over fascism in the Great Patriotic War, and the 2014 annexation of Crimea. Crimea in particular is seen as a symbol of the revival of the Russian state, and a finger in the eye of those who, like the United States, sought to weaken and exploit us during the 1990s. Of course, the final bulwark against a popular uprising is our domestic coercive apparatus, which includes the Federal Security Service (FSB), the various elements of the Ministry of Internal Affairs (MVD), the Federal Guard Service (FSO), and –as a last resort – the armed forces of the Ministry of Defense. Most important for domestic order, however, is the recently established National Guard (Rosgvardia), which became operational last year and now has some 400,000 individuals on its payroll. Roughly half of the 400,000 are security guards in the so-called FGUP Okhrana, used for the protection of government facilities or hired out as guards to private entities. But Rosgvadia has its own armed force of so-called Interior Troops, which includes the elite “Dzerzhinsky Division” outside Moscow, as well as SOBR SWAT personnel, who are used primarily in support of local police. 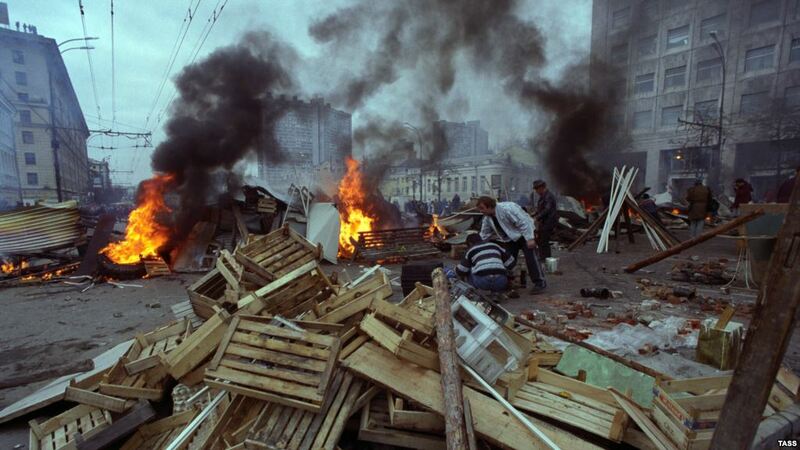 The core force ensuring domestic political order, as in the past, is Rosgvardia’s OMON, the anti-riot troops, made famous during perestroika by its crackdowns on the mass demonstrations. 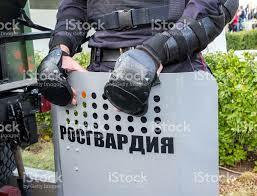 Most of Rosgvardia’s employees were hived off from the MVD. Its establishment did not, therefore, mean an increase in overall numbers of domestic security personnel. It entailed instead a reorganization of the previous system. But it was an important move nonetheless. To begin with, its separation from the MVD would complicate any coup attempt by creating an additional chain of command among internal security forces. Rosgvardia also reduces the risk of what used to be called “localism” (mestnichestvo) – that is, the loyalty many regular MVD militia have to local elites and communities, which might, should push come to shove, lead them to disobey your orders. 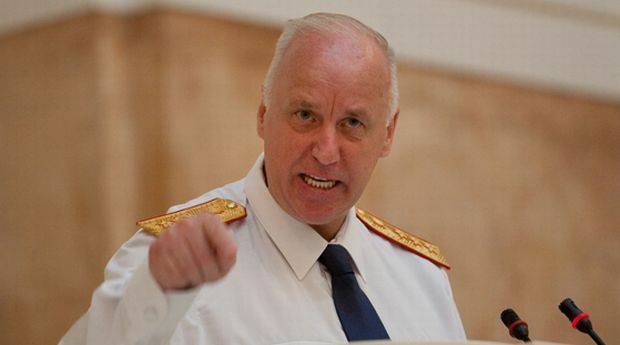 Most importantly, it places the core elements of our internal security apparatus under the direct command of your iron-fisted friend and judo partner, Viktor Zolotov. Moreover, you issued a decree last year that gives you, as president, the right to transfer “units and divisions of the Armed Forces of the Russian Federation, as well as other military formations and bodies… to the tactical subordination of the district commander to perform tasks assigned to National Guard troops.” That is, regular military units could be placed under Zolotov’s command should our country experience the kind of chaos that enveloped Ukraine in late 2013. We believe that it’s very unlikely that we’ll need to resort to extraordinary measures at any point, and certainly not in the coming weeks and months. One reason why is that everyone knows you’ll take whatever measures are needed to preserve order, including the use of large-scale force if it comes to it. That acts as a critical deterrent. The public in general, and the opposition in particular, understands that you are not Gorbachev – or Medvedev, for that matter. In the unlikely event we have resort to more extensive repressive measures at some point, we are better prepared than we were in 2011-12. Above all, we are now aware of just how important it is to contain mass mobilization early, before it gets out of hand – before, that is, a tipping point is reached whereby fence sitters decide enough people are already out on the streets to make the risks of protesting acceptable. To keep us from approaching that tipping point, we continue to harass and undermine the anti-system opposition in myriad ways. We deny many (but not all) requests for permits for protest demonstrations. We issue permits for protests in inconvenient places and at inconvenient times. We raid the offices of opposition groups and confiscate equipment on trumped up charges. We designate opposition organizations as “foreign agents,” which constrains their activities and makes them even more vulnerable to police raids and criminal prosecution. We detain, arrest, and fine those who try to organize unlicensed protests, along with those who participate in them. We seize fliers and other opposition propaganda. And we allow local authorities and supporters to engage in various forms of intimidation, including physical attacks in some case. Sometimes these measures are organized out of the federal center, even from the Kremlin, but in most cases they’re initiatives of local officials carrying out what they assume, correctly, to be your wishes. Our response to the protests Navalny organized this past weekend is a case in point. We banned protests in larger cities on Sunday, and we announced last week that any “violations of the law on mass gatherings” would be severely punished. We arranged for a large and very visible police presence at key protest sites. 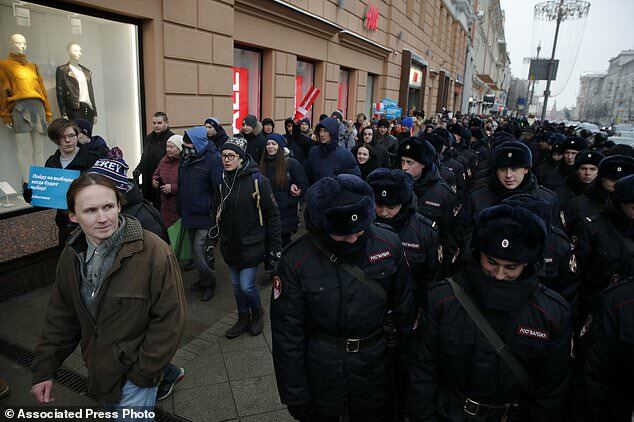 Sunday morning the Moscow police broke into Navalny’s headquarters and tried (unsuccessfully, it turned out) to stop its live broadcast of protest events across the country – our deliberately provocative excuse being that the office had been the target of a bomb threat. 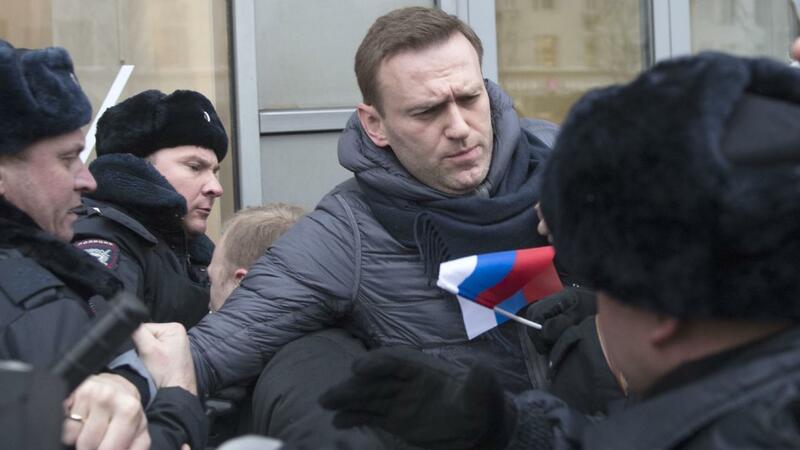 The police then roughed up Navalny in the process of detaining him as the Moscow protest was getting under way. He has since been released, but he’ll once again have to appear in court, where he will be fined or, more likely, sentenced to a stint in jail. He has already spent some 60 days in jail since his campaign began. Across the country, we arrested more than 250 protestors on Sunday, and they, too, face fines or short jail sentences. Turnout for the protests, it should be noted, was relatively modest, smaller than in the past. We believe they are very likely to remain small and easily manageable in the coming weeks and months. But if we are wrong, we can always step up repressive measures, as we did in early 2012, including harsher police actions on the streets and stiffer sentences. And if need be, we can arrest and imprison Navalny for a prolonged period. You will recall that Navalny was convicted in 2013 on trumped up embezzlement charges. We can frame and convict him again, but this time make him serve a multi-year prison sentence, should we decide that he’s more of a risk at large than behind bars. If there is one thing we learned from the disaster of Gorbachev’s perestroika, it’s that fundamental political and economic reform is always risky and often very, very costly. There was, perhaps, an opportunity for you to step off the political stage in 2011, which would have meant allowing Medvedev, with his “modernization” and partial liberalization projects, to take the country in a different direction. But that window has passed, for better or worse, and we’re now committed to the path you set us on at the beginning of your current term. This is so for many reasons. Our crackdown on the opposition in 2012 has significantly raised the stakes of our political struggle with the anti-system opposition. Our political and economic elite has an even greater stake in your system of personalized control than it did back then. And our annexation of Crimea and role in the Donbas war have made our relations with the United States and its Western allies even more adversarial than before. 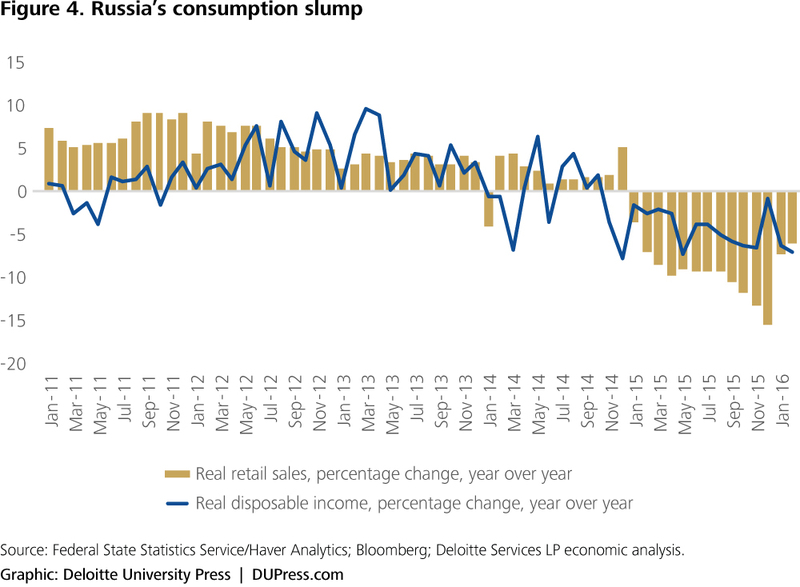 There are some in the loyal opposition – notably Alexei Kudrin and his ilk – who argue that we should commit to a program of fundamental reform, the goal being to reduce corruption and other systemic inefficiencies, and to raise the trend rate of GDP growth. They claim that if we don’t, we’ll face years of economic and political stagnation, just as the Soviet system did during the “era of stagnation” under Brezhnev. But have they forgotten what happened under Gorbachev? Have they forgotten that the effort to fundamentally reform Soviet socialism didn’t rescue it, it destroyed it? Have they forgotten that during the “era of stagnation,” we had political stability, an economy that was growing slowly but steadily, and international respect as a global superpower? Low but steady economic growth, slow but steady improvements in material conditions, and domestic stability and internal order are much, much better than the likely alternatives – chaos, deprivation, and humiliation, as in the 1990s. Consider also what would happen were you to leave office unexpectedly, for whatever reason. The immediate effect would almost certainly be a dangerous struggle for power among our political elite. Sechin is currently seen as your most likely successor, but he doesn’t command anywhere near the respect that you do from our elite, from society, or from our executive bodies. Moreover, it is entirely unclear who would prevail in that struggle. Aided and abetted by the West, with its myriad instruments for regime destabilization, anti-system forces could use the opportunity to take to the streets, just as they did in the late Soviet period. The outcome might well be another disastrous, utopian experiment in revolutionary change, liberal, fascist, communist, or whatever. All the progress we’ve made since you took power in 2000 would be put at risk. In short, Mr. President, it is your historic duty to remain in office and defend our state against its internal and external enemies. At some point, the time will come to oversee an orderly succession. But that time is still well ahead of us.